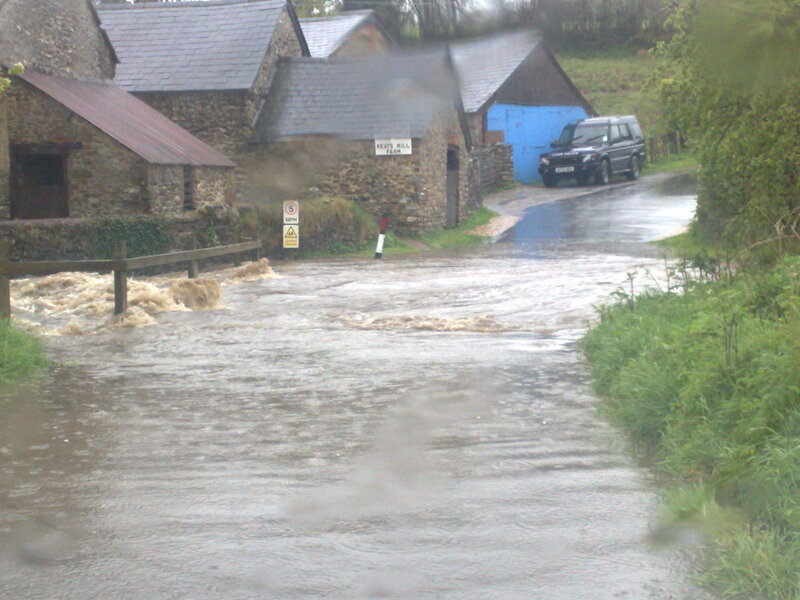 And this is the ford on the road to Marsh, which is left off the road to Bishopswood. The water was coming down in such a torrent! 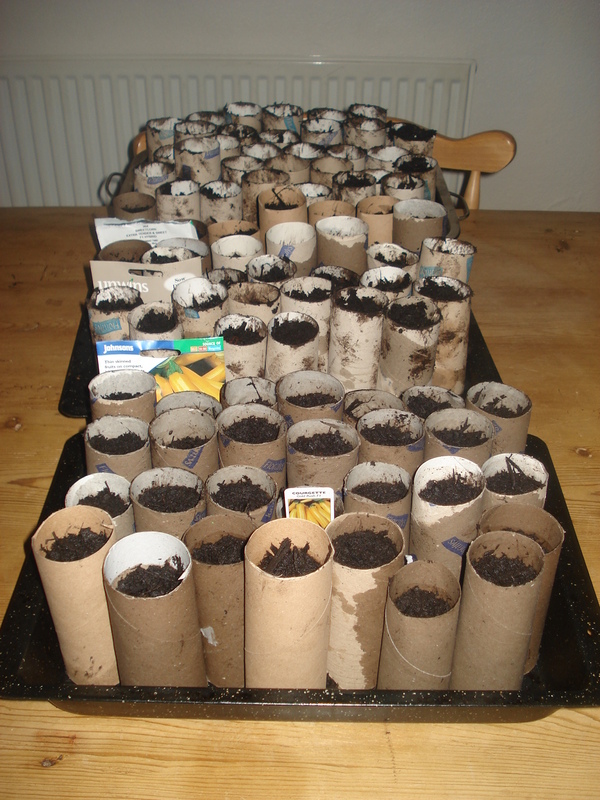 Beat the weather gardening, or sowing seeds indoors when its raining outside and you don’t have a greenhouse!! 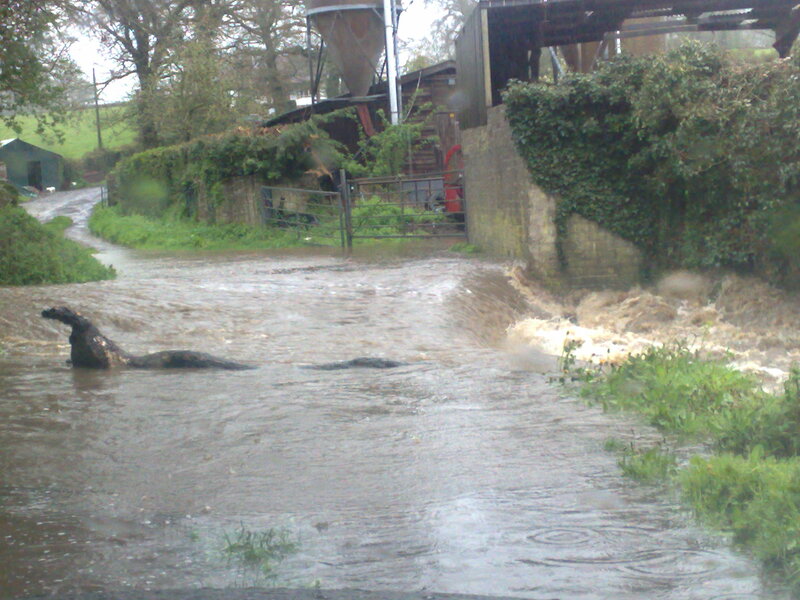 Like most of the UK we have been experiencing a lot of rain in the past 2 weeks. In fact we have had 2 inches of rain in the last couple of days, as well as hail. Down by the hens it is just mud, it is so wet. The hens don’t seem to mind too much, they still spuddle around in the puddles and even drink from them. They do look a bit bedraggled but are still producing eggs, – we got 13 eggs from 14 hens today, so not too bad.However, for us humans day time rain, although needed as many parts of the UK have drought conditions and hose pipe bans, is just a nuisance as it stops us from getting on with the outdoor work that we want to do. Unfortunately I don’t have a green house yet, so getting seeds started means either sowing direct into the ground, and it is just too cold at the moment, or sewing indoors. Then I moved them onto our south facing window sill in the dining room. 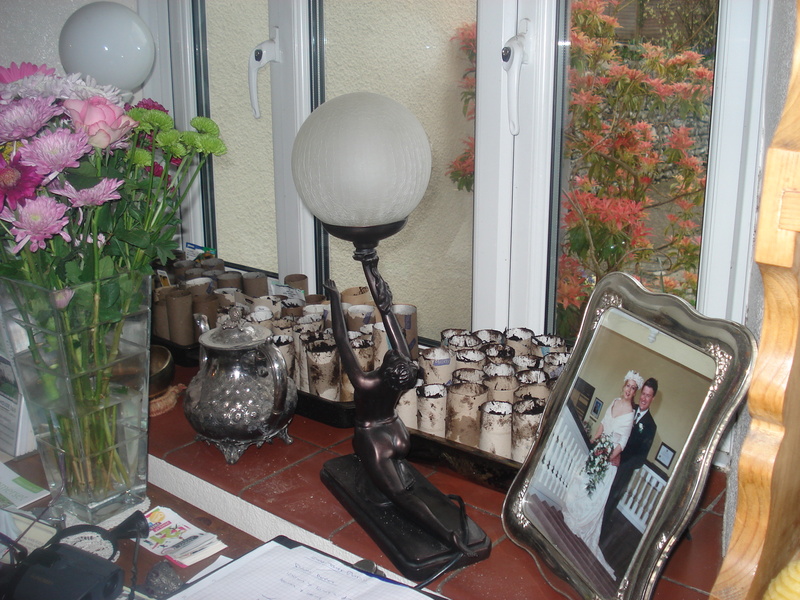 You can even see our wedding photo on the window sill, which we still keep there, although we have been married for coming up 18 years now!! 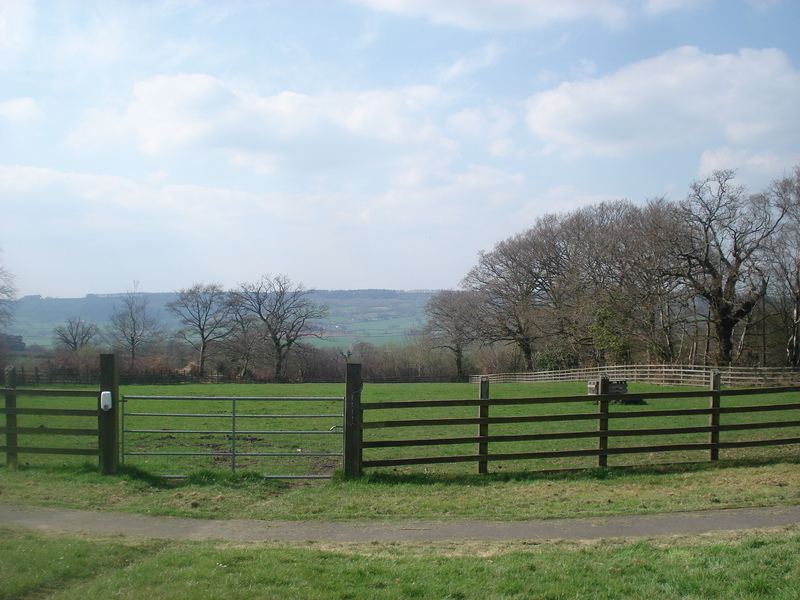 After the heatwave in March it has been cold this April with typical April showers and sunny spells. So our gardening has had to be done dodging the showers. 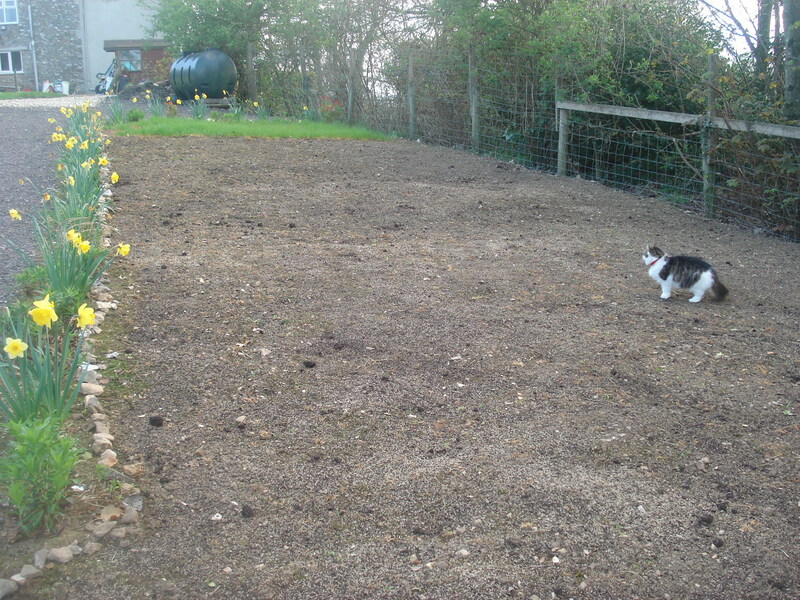 Firstly we have 4 large areas that we have laid with lawn seed. We bought a 25 kg bag of lawn seed off Ebay and mixed this with compost so that the seed had something to stick to and then sowed it by hand, all before it rained. You can see Tia, one of our cats, got in on the picture, and also you can see the border I created in the Autumn with daffodil bulbs and a stone edging, all stones taken out of the garden. Next it was time to get the potatoes in. Our first earlies went in a few weeks ago and are already coming up. Our second earlies and maincrop had been left to chit and were now ready for planting. Here are the maincrop Anya potatoes that have chitted. 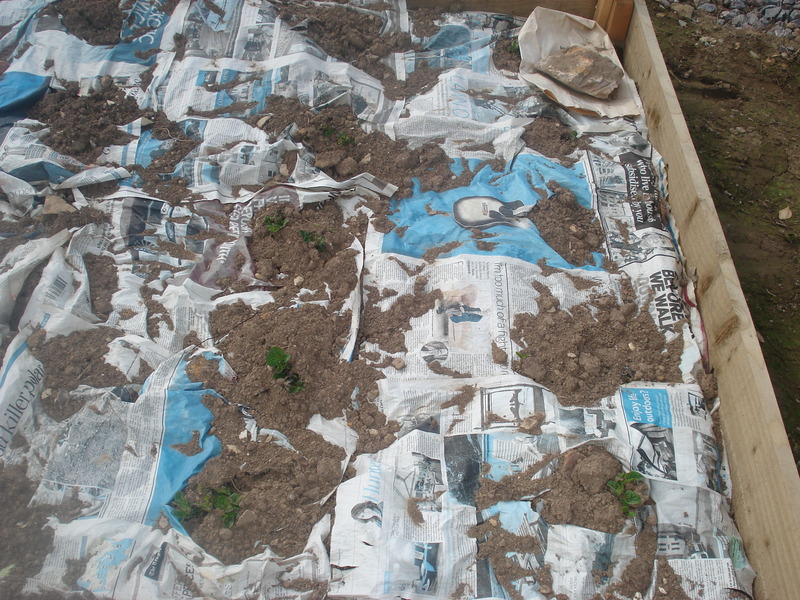 We use newspaper as poor man’s weed suppressant sheet. It keeps the weeds at bay for a while and then eventually disintigrates, so is quite handy to use. So then I got to planting out the potatoes. 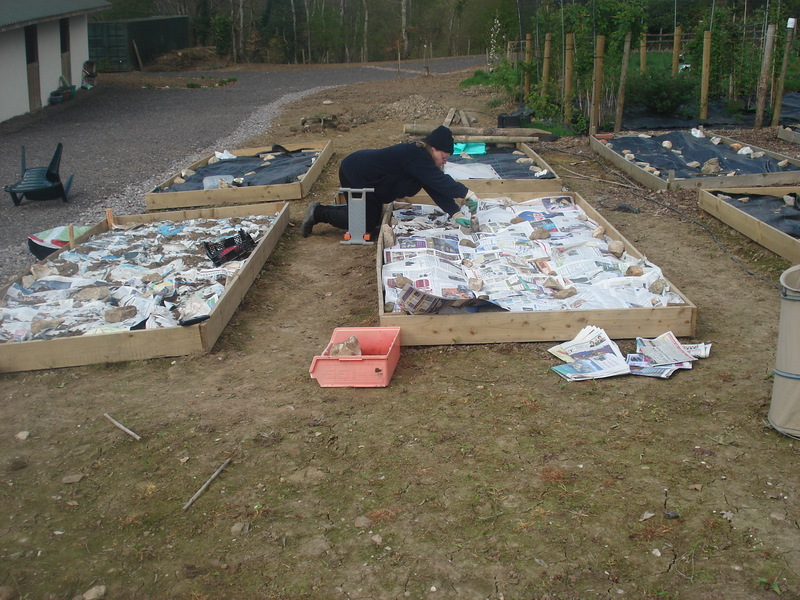 We also planted a bed of onion sets, and then under cloches I planted spinach, raddish, beetroot and salad leaves seeds. 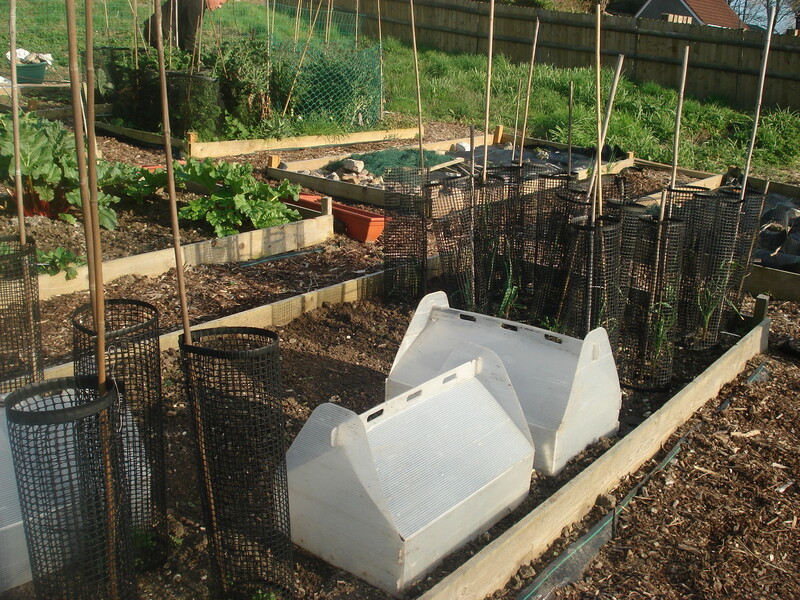 You can also see the shrouds that are round each of our garlic plants. This is to protect them from the rabbits that ate the lot last year. 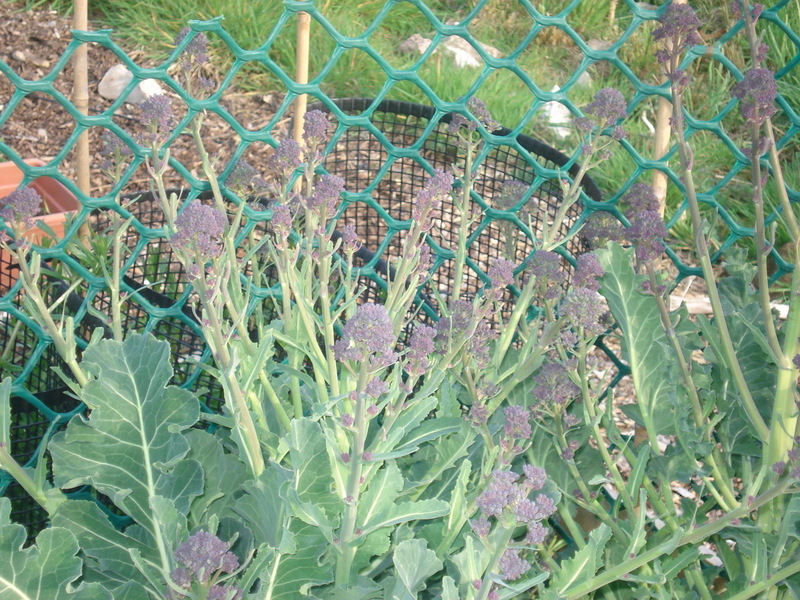 Elsewhere in the garden the purple sprouting broccoli is plentiful and we have been eating it with every other meal. 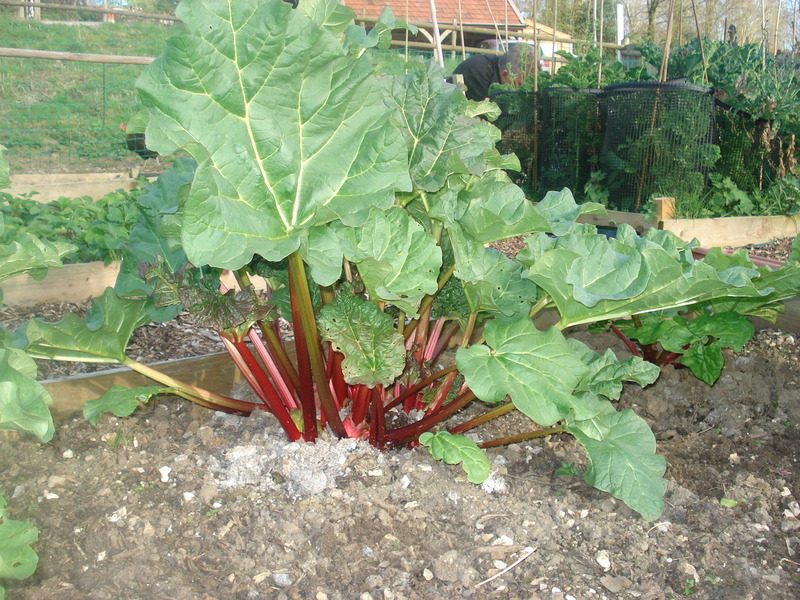 We ate the first of the seaon’s rhubarb on Tuesday this week. I have 6 plants so can pull a couple of stems from each plant so not to weaken them by pulling too much from any one plant. 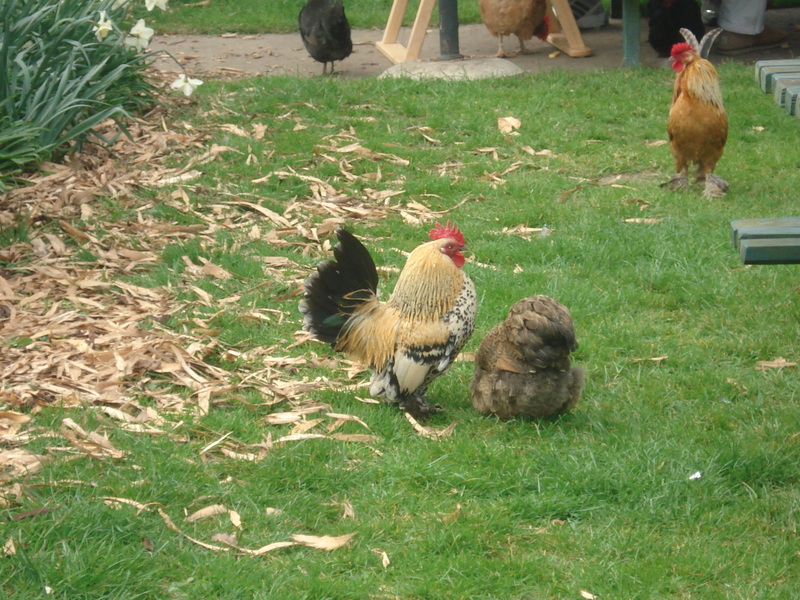 We have had to say Goodbye to one of our Cream Lebbar hens. She was so poorly she couldn’t even stand up in the end. 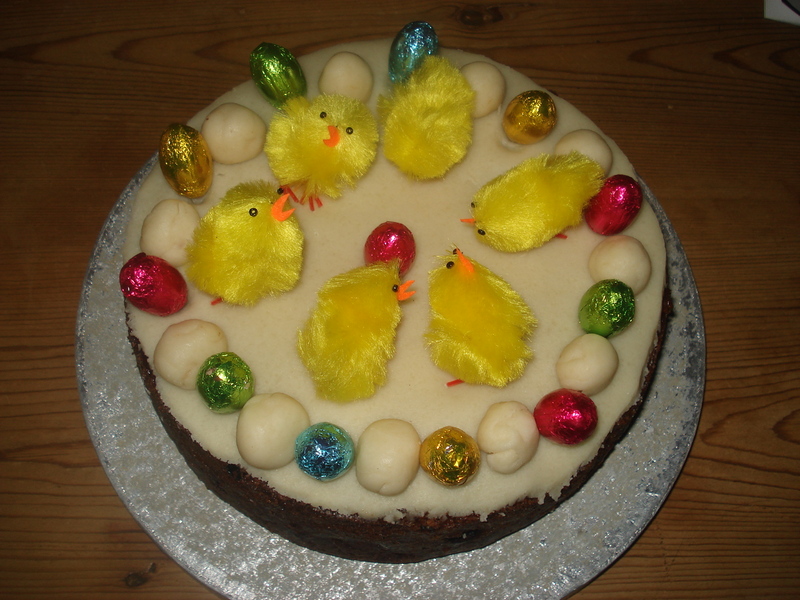 I said to my husband, if this were a cat or a dog, you would take it to the vet and have it put down, so perhaps we should despatch this hen and put her out of her misery. It’s not a very nice task, but I didn’t have to do it. Neil wrung it’s neck and put it out in the woods as fox take away. A couple of weeks ago this hen was standing away from the flock and fluffing up her feathers. She didn’t seem interested in food, and wouldn’t come running when we threw down bread or grain. She became more immobile as the days progressed, and got that she wouldn’t go up the ramp into the hen house at night, and Neil was lifting her up and putting her in the nest box. She wouldn’t come out again in the morning and again we were lifting her out. Until she was just so weak that it was cruel to keep her living any longer. We spoke to a farmer friend of ours who suggested it might be a respiratory disorder but it is difficult to know without taking the hen to the vet and economically it just doesn’t add up to take a £10.00 hen to the vet and pay £40.00 for advice, – you could buy another 4 hens with that money. So it was Goodbye Mrs Cream Legbar. At least the other 14 all seem healthy enough. We had 14 eggs from 14 hens yesterday, so can’t complain at 100% production. 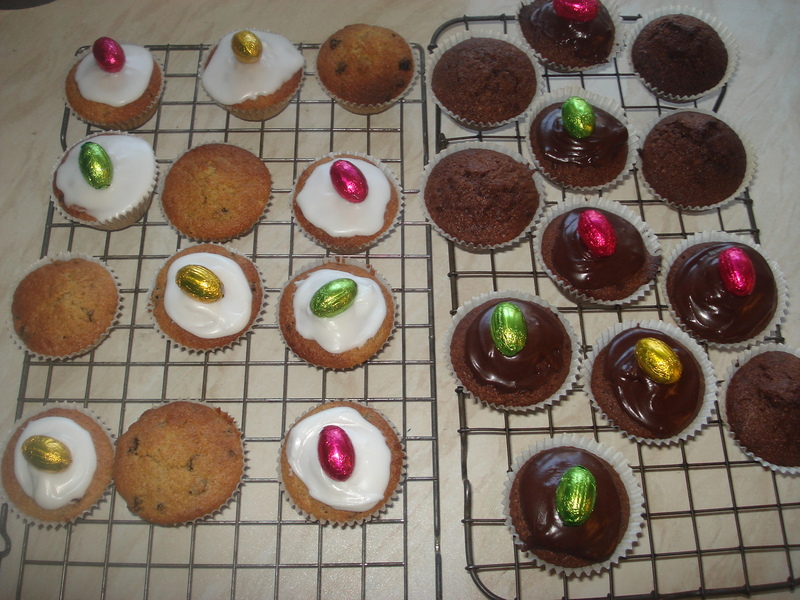 The hen that died was the only one that laid cream eggs, the rest are shades of brown, with the other cream legbar laying blue eggs. So there we are – life in the country, where death is all part of the circle of life. Yesterday being a lovely sunny day, and even better than that it was my birthday, we decided to go out to lunch and we visited the modern new cafe at Ferne Animal Sanctuary. Had yummy Thai fish cakes and then went for a wonder all round the grounds and looked at all the rescued animals. 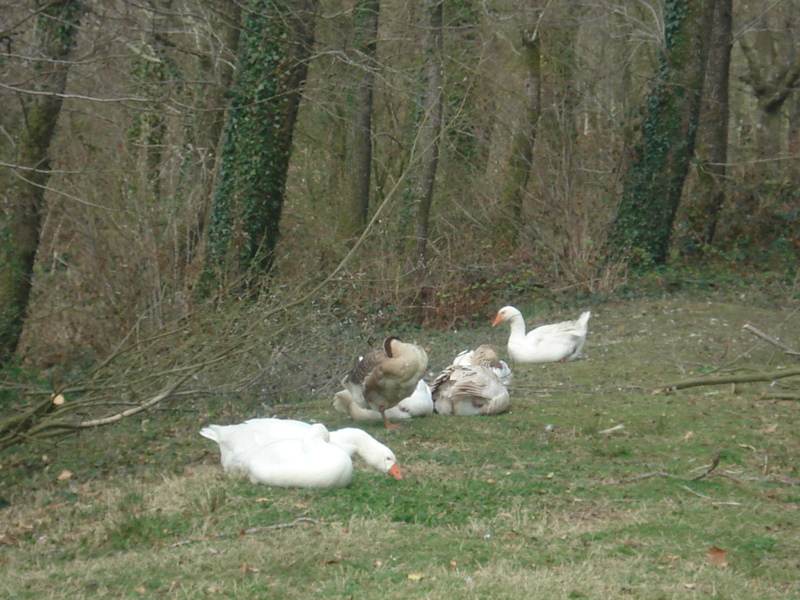 They have a number of free range hens of all different breeds. 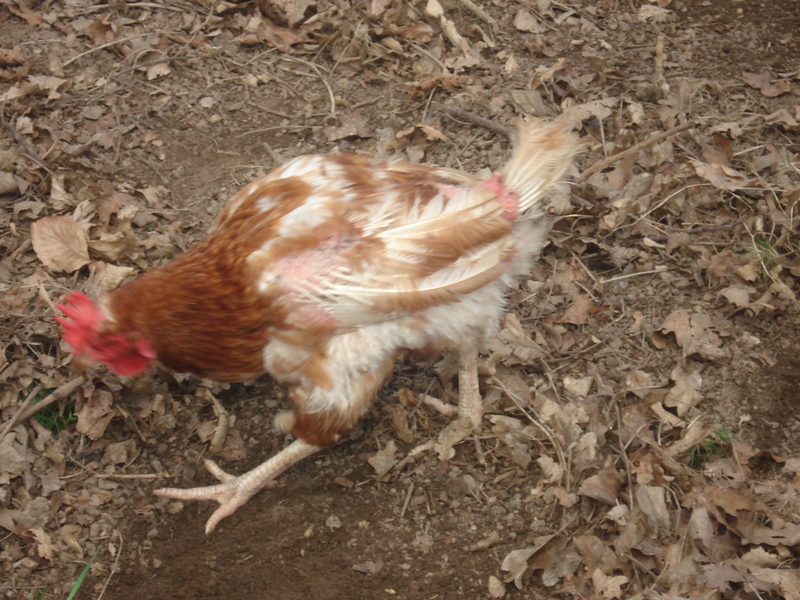 There were also some newly rescued ex battery hens which were still in a sorry state. At least now they can scratch around in the open and in time their feathers will grow back. 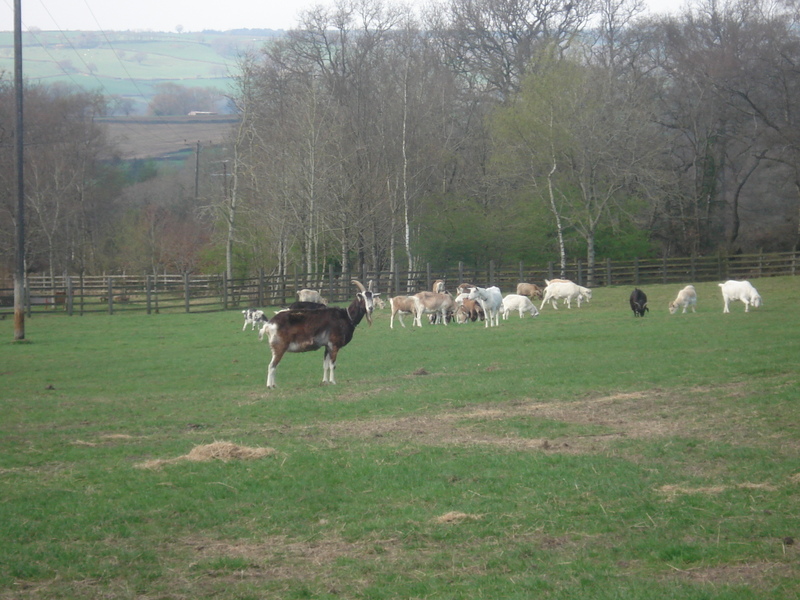 and some goats that have a big field to roam around in…….. 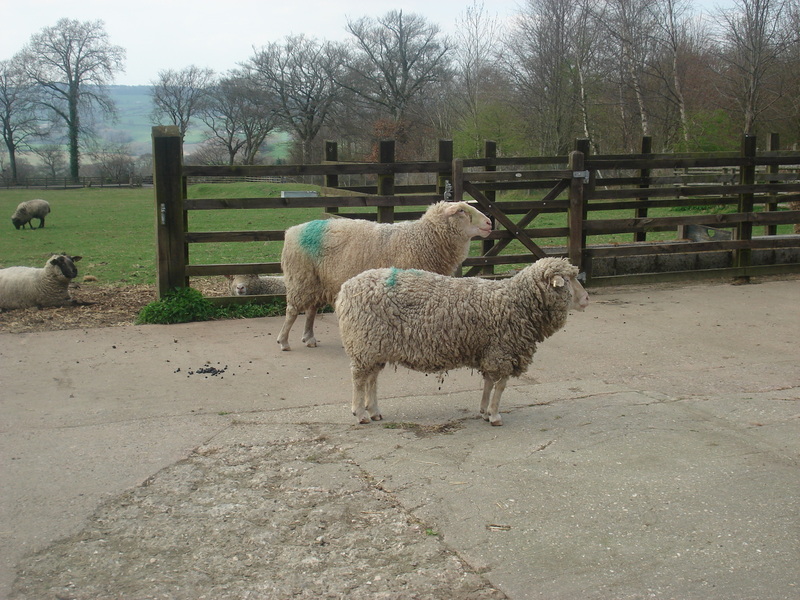 There are rescued cows and an odd mix of old sheep…. Ferne animal sanctuary do a great job taking in unwanted pets, and rehoming where possible, but where it isn’t possible they provide a permanent home. All this is done with donations from the public, there is no charge to enter. So before we left we made a contribution to all their good work.